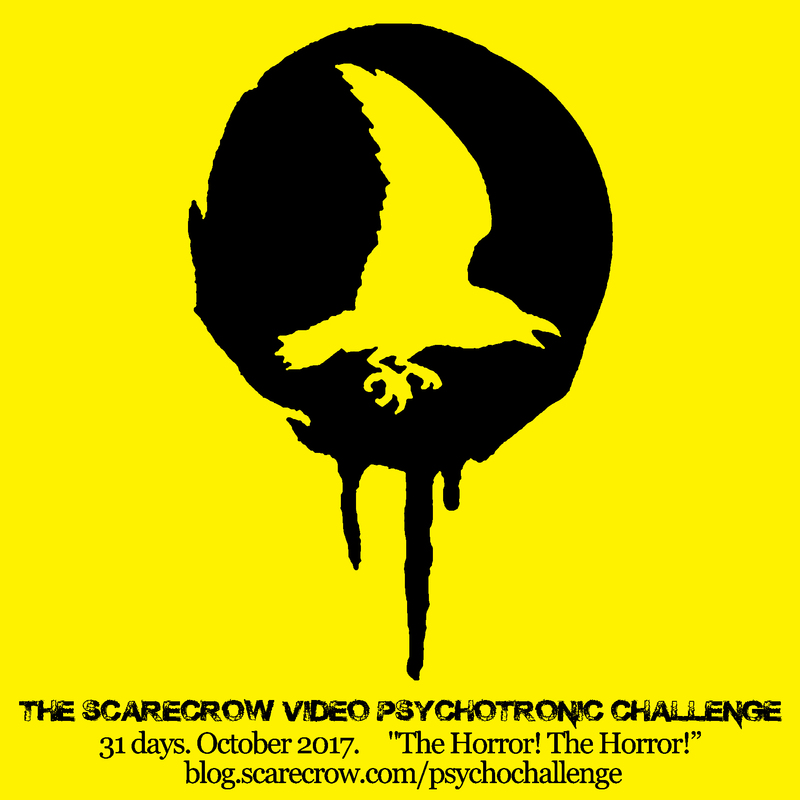 The Second Annual Scarecrow Psychotronic Challenge! It’s that time again. A whole month of psychotronic viewing, with one new category for every day in October! Are you up to the challenge? A quick addendum: Our shop doesn’t believe that bigger budget movies should be excluded from this challenge so we are all for you watching Van Helsing or the 2010 Wolfman if you feel that trash is worth your time. That being said, the low budget grinders usually deliver something special so our preference almost always lies with the underachiever. It’s glorious down here, come join us. • Watch at least one movie per day during the month of October in whatever order suits you. • What you set your eyes on must fall within the psychotronic parameters set above. • Have fun and get weird. 1. COMING IN HOT: Cleanse the palate with scenes engulfed in flames. Carrie prom? Too easy, it’s a challenge y’all. 2. LADY’S CHOICE: A murderess on the hunt. 4. THERE’S A BAT IN MY NIGHTDRESS! : Gothic horror, not just for gargoyles on buildings anymore. 5. DESATURATED VISIONS: A black and white version of an otherwise color movie. 6. ESTATE SALE: A story about possessed possessions and other haunted furniture. 7. SHOW ME THE MUMMY: A riches to rags story. 8. “IS THAT YOUR SPLEEN?”: A body horror best enjoyed on an empty stomach. 9. OFF-BRAND SLASHERS: No Jason, Freddy, Michael, Leatherface or Chucky. Blatant rip-offs preferred. 10. AFFORDABLE SCARE ACT: Hospitals, mental or medical. Horrific deeds in the big white building. 11. DON’T QUIT YOUR DAYJOB: Horror icons acting in less than iconic roles. 12. THROWBACK THURSDAY: Newer horror made in the style of the classics. 13. An actual FRIDAY THE 13TH in October(!) demands you watch any of the Friday The 13th franchise films. Even part 5, which is terrible. 15. HAUNTED HOUSE WARMING PARTY: A new homeowners worst nightmares come true. 16. RURAL HORROR: The dangers of city folk nosin’ around where they don’t belong. 17. URBAN HORROR: The dangers of city folk nosin’ around where they do belong. 18. RAW MEAT ON THE STREET: A heaping helping of the subdermal proteins. A “gore”geous bounty. 19. COMEDIC CHOPS: More comedy than horror. It’s okay to laugh, even in October. 20. NETFLIX AND KILL: Movies about real life serial killers. 21. VIDEO STORE DAY. The most important day of this challenge. Watch something physically rented or purchased from an actual video store. If you live in a place that is unfortunate enough not to have one of these archival treasures then watch a movie with a video store scene in it at least. #vivaphysicalmedia! 22. NO CHILD LEFT BEHIND: The horrors in school don’t have to end when you graduate. 23. EVIL KIDS: Big terror in a tiny vessel. Pre or post birth. Don’t even think about pinching that cheek. 24. MILLENNIAL MADNESS: Internet horror, not just for teens. 25. SIEGE THE DAY: Surviving in a single location, is it worth it? At least you’ll live to figure it out. 26. EVERY WHICH WAY AND ON THE LOOSE: Giant monsters are mad as hell and wreaking havoc. 27. THREATS FROM THE OUTER RIM: Monsters in space terrorize the ship. 28. FOREIGN AFFAIRS: Watch something made anywhere besides the U.S.
29. REMADE IN AMERICA: Foreign horror later remade here in the states. 30. TIARAS OF BLOOD: Scream queens are the true heroines of horror. 31. SORE THROATS AND POPCORN STAINS: Now that you’ve accomplished your challenge goals and bragged along the way, we urge you to celebrate. Invite your friends over and watch a movie you can’t help but yell at. Get loud. Get rowdy. You tried to warn them and look what happened… They never listen. Jensen Ward is a Scarecrow employee and a literal rock star. ← New Releases for September 19!